Stan Lee - comic book legend and cocreator of Spider-Man, the X-Men, the Avengers, the Incredible Hulk, and a legion of other Marvel superheroes - shares his iconic legacy and the story of how modern comics came to be. Stan Lee is a man who needs no introduction. The most legendary name in the history of comic books, he has been the leading creative force behind Marvel Comics and has brought to life - and into the mainstream - some of the world's best-known heroes and most infamous villains throughout his career. His stories - filled with superheroes struggling with personal hang-ups and bad guys who possess previously unseen psychological complexity - have added wit and subtlety to a field previously locked into flat portrayals of good versus evil. Lee put the human in superhuman and in doing so created a new mythology for the 20th century. Stan Lee tells the story of his life with the same inimitable wit, energy, and offbeat spirit that he brought to the world of comics. Moving from his impoverished childhood in Manhattan to his early days writing comics, through his military training films during World War II and the rise of the Marvel empire in the 1960s to the current resurgence in movies, Amazing Fantastic Incredible documents the life of a man and the legacy of an industry and career. Excellent job! so awesome to listen to the story of how Stan came up with the characters that we have all learn to love. cute, funny, short and very well narrated story. Stan is the man and this is his story (in brief). A fun and entertaining read. Would you listen to Amazing Fantastic Incredible again? Why? Having heard the whole story (very economically shrunk down to less than 2 hours), I look forward to hearing it again. Stan Lee is an American treasure and in a league with Aesop, Doyle, Dickens, Steven King and World Wrestling Entertainment. "Just a couple of guys writing and drawing stories" have become a world-wide franchise and their characters beloved by millions. What does Peter Riegert and Stan Lee bring to the story that you wouldn’t experience if you just read the book? By turns humble, hilarious and intriguingly introspective, this is definitely a story only Stan could deliver. This is an "American Dream" story - good guys working hard and (eventually) getting the success and accolades beyond their wildest dreams. Inspirational - with really awful jokes along the way. Irresistible. I dare you to hit the stop button and interrupt this wild and wonderful tale. It was so fun and entertaining! Definitely made my work day a lot better. Stan Lee is the man!!! Unfortunately, I would have loved a lot more detail on Stan's memoir. Most of his stories are a couple of throw away lines leaving you wanting a lot, lot more. There were some sound problems on my copy with the reader occasionally screaming then whispering at times. Both leaving me to fiddle with the volume, something I've never had to do before. If you could sum up Amazing Fantastic Incredible in three words, what would they be? 'Nuff said! It emerges as a unique look at the history of a formative figure in the redefinition of the comic book form. What other book might you compare Amazing Fantastic Incredible to and why? Have you listened to any of Peter Riegert and Stan Lee ’s other performances before? How does this one compare? The untold backstory! Thrilling! Chilling! I decent look into the writer behind Marvel. I really like the book I just wished it went a little deeper into his process in writing the comics. What a genuine force of creativity, escapism, and capitalism. Had a hard time not tearing up through most of this. 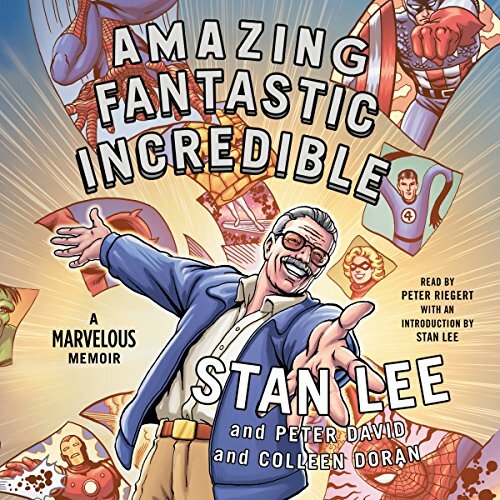 First of all, if you love Marvel/Stan Lee, this audio book is a must. It’s astonishing how much material about Stan’s life gets covered in such a short amount of time. Plus, Lee himself narrates the intro! Second, this is one of the funniest things I’ve listened to in quite some time. Stan Lee always was one of the best showmen in the world and every sentence in this book is polished with his patented charm. Nuff’ said. Beyond highly recommended!